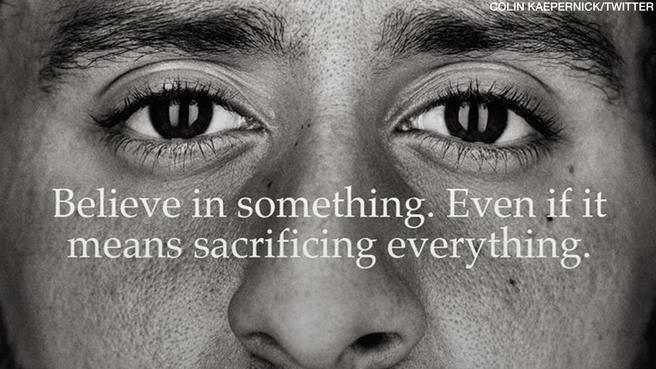 Yesterday, Nike dropped a marketing bomb by featuring Colin Kaepernick’s face on the “Just Do It” 30th anniversary ad. For those of you who don’t know it, Kaepernick is an American Football player who caused controversy in 2016 when he decided to kneel on one knee rather than stand during the US anthem, in protest against racial injustice in the US. In the aftermath of the event, he received acclaim and awards such as Human Rights organization Amnesty International’s 2018 Ambassador of Conscience Award, but was also allegedly blacklisted from the NFL. The new Nike ad featuring Colin Kaepernick. While I have tremendous respect for Colin Kaepernick’s move and statement, I am not comfortable with the new ad that is dynamiting social media. The poster features a close-up of Kaepernick’s face with the quote: “Believe in something. Even if it means sacrificing everything.” First off, I can think of tens of activists who have been sacrificing way more than Kaepernick and don’t get to be on a billboard, but hey, I guess you’ve got to use fame to reach out. Second, I am getting quite tired of the so-called original, risky tacticks which consist of doing...Trump-bashing - yeay, how bold, how controversial! In an age where virality is what matters and where there's nothing more viral than talking about Trump, using a figure which is knowingly hated by Trump was the least unexpected move possible. Also, Nike being a global brand, I'd have appreciated a narrative that moves a little further from the US political agenda. If the brand is as worldly as it claims to be, it might need to think twice about its target market and try to channel more worldly campaigns. But, more importantly, Nike is playing an incredibly hypocrite game here. At the beginning of this very summer, the brand dropped its sponsorship of the Iranian football (soccer) team right before the FIFA World Cup, claiming US sanctions (which were already in place in the past without causing issues to Nike’s Iran sponsorship). Ironically, they pulled out the very week they released the Airmax One World collection, featuring the world’s different flags – how candid, how adorable. So, while Nike is claiming that people must believe and sacrifice, all the brand is ready to give up on is the consistency of its message (and sustainableproduction processses and good working conditions for its labour, let’s remember that too). While I understand that Kaepernick is using this platform to raise attention on racial injustice, I am extremely saddened that Nike’s open-minded message falls apart the second the surface is scratched. The last years have seen political ads flourish, claims to want to build a better world, to make an impact, etc. While I’m extremely glad that our generation is more politically aware than the previous one, it is up to us not to be fooled by marketing agendas. Among the Heineken, the Pepsi, the H&M and the Nike, not a single brand has been able to advertise its own success towards more inclusive work conditions , racial or gender equality at the office, or environmentally-friendly, sustainable processes. As I write now, Nike is actually just reopening shops which closed last week in South Africa amid a ...racial scandal. Mark Parker, CEO of Nike since 2006. The hypocrisy of these brands is blatant and it is up to us customers and social media users to accept what we are being fed or to call out brands for not aligning with what they claim to believe in. Just like a political figure, Nike now wants to be elected rather than bought, it should then be treated as such. So let's role play and compare Nike's behavior to that of Trump. Just like Nike dropped the Iranian team's sponsorship a week before the World Cup, let's hypothetically pretend that Trump would go as far as deciding to not let Iranians come to his country without notice... How would we react? Oh, and what if he would do that, but on top of it, he'd be claiming that he defends racial inclusion? Yes, even Trump wouldn't... but Nike may just have crossed this line. While I am glad that racial inclusion is at the forefront of the social conversation, let's not be fooled by glossy ads which benefit nothing but Nike. And since the brand decides to be a social player, let it be treated as such. Who knows, during the next World Cup, maybe the Iranian football team will be headlining its campaign. Could a 1969 French-Algerian film be any similar to a 2018 US comedy? They say if you send them out to the universe, your dreams will happen. If Nike wants to be political, it should be treated as such.